Craig (Bob Morely), Liz (Georgina Haig), Nina (Sophie Lowe) and Marcus (Xavier Samuel) are Australian teens out on a camping vacation in the Outback. While driving on the road they are rammed by a road train (sort of a semi-truck hauling two full sized trailers). They decide to try and over take it, when it smashes into them and wrecks their truck. Crawling out of wreckage, they find the road train parked nearby but nobody in it. As they have a look around, someone starts shooting at them, so they steal the truck to get away. If the truck’s three headed-dog hood ornament is any indication, they might have been better off facing the crazed shooter. ‘Road Kill’ was not at all what I expected. I thought I would be going in to something not unlike ‘The Car’ (1977) or ‘The Duel’ (1971) with a killer vehicle chasing down unsuspecting Aussies on the highway. 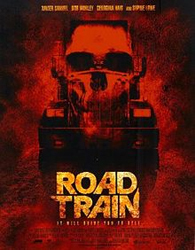 Most of ‘Road Kill’ takes place in and around the road train while it’s parked. The back trailer is haunted with something and the front trailer seems to have a lot of tubes underneath that drip blood. The total lack of explanation for anything makes for some very eerie moments but also makes character motivation a little murky. The score is an interesting mash-up of electronic drones and a sort of country vibe.